I’m surprised I never thought of this until now, after about fifteen years of doing Forgotten New York. I’ve seen these historic plaques mounted on poles as I travel in Nassau and Suffolk Counties, and a very occasional one in the five boroughs. They’re part of an initiative devised by New York State Education Department in 1928 to mark places of historical significance, and for nearly forty years, almost 2800 such markers were placed all over the State. The signs themselves are marvels of design, in my opinion. Most of them feature dark blue backgrounds with gold raised block lettering and trim, though there are variations in color and lettering, and very occasionally, shape, just to change it up, I imagine. The State discontinued the series in 1966 after high speed travel on expressways became the norm. This flickr page that assembles photos of the State markers taken by various photographers illustrates the basic, simple and readable design of these signs. No study had yet been made of the 92 locations within the five boroughs that these signs delineated, so I decided to do one myself with photographs culled from my own collection; I also used scans from books I had in my collection, and screen captures from Google Street View. It should be noted that this page doesn’t include the brown and gold markers placed by the Richmond Hill Historical Society and the blue and gold ones placed by the Woodhaven Cultural and Historical Society, which closely resemble the New York State signs. I gave those signs their own page a few years ago, though I didn’t catch them all. Of the 92 NYS historical signs placed around town beginning in 1928, only a mere handful are still there. Over the decades, the local youth have removed or vandalized them, some have been claimed by new construction or car crashes. 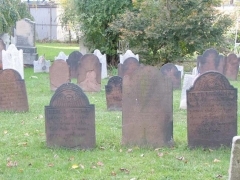 Some of the remaining ones are in very poor shape, while others have been restored to better-than-ever construction…. In each case I’ll give the location as shown on the NYS Museum site, as well as the text as originally rendered on the sign, per the Museum listing. If you’ve been following this series, you know that some of these historical markers delineated some little-known objects and were placed in out-of-the-way places — while some obvious sites went unmarked! Site of Indian village attacked by Dutch 1643 and of British redoubt during the Revolution. Thus, this site figured in both the Dutch settling the island and as a British stronghold 130 years later. 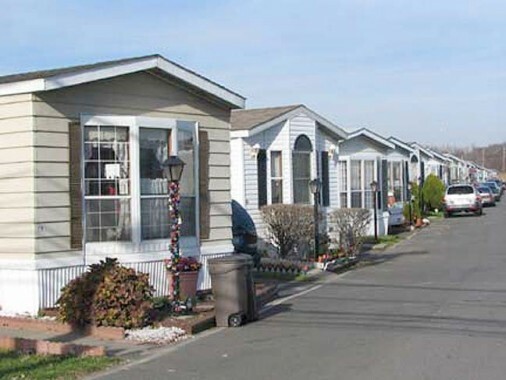 While it’s true that NYC’s zoning regulations prohibit trailer parks — making them nearly nonexistent in the five boroughs — developers Fred and Frank DeDomenico built the 9-acre trailer park using a loophole that allows mobile homes in areas zoned for manufacturing. 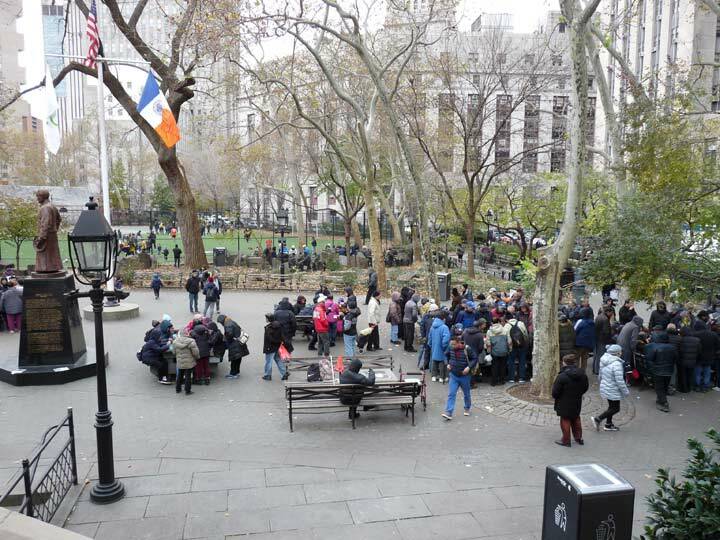 Though they wished to open the park in 1969 it wasn’t till the 1980s and a victorious lawsuit aganst the City Planning Commission that tenants finally moved in. In 1995 the park was sold to Garden Homes Management Corporation, and much-needed repairs were done. One of the rules of the park is that wheels on the mobile homes have to be concealed. Not all the venerable buildings on the Richmondtown Restoration village were given NYS historical markers, but the Christopher House, on Arthur Kill Road south of Richmnd Road, set way back from the road, did get one. Erected about 1750. Home of Revolution, traditionally, meeting place of S.I. Patriots. Meanwhile, my same source gives the original location for this house at Victory Boulevard and Willowbrook Road, several miles south. This was one of the many historic Staten Island buildings that were moved to the Restoration in 1969, when it was being developed. The original section of the house was built approximately 1720 or 1730, a simple stone house built in the practical saltbox style. The 22-inch width of the fieldstones seal it well from the elements. It was built by farmer John Christopher, and was later occupied by a nephew of Governor Thomas Dongan. The house was a private residence before 1962, was granted NYC Landmark status in 1967, moved to the Restoration in 1969 and after extensive rehabilitation was opened to the public in 1977. 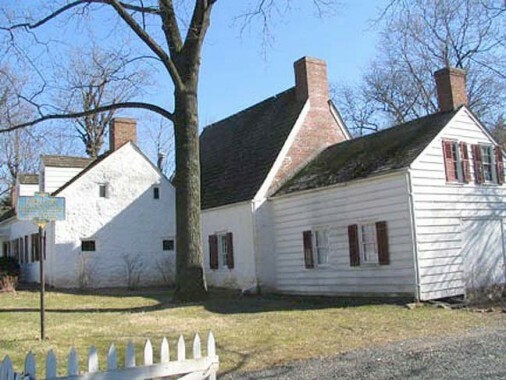 During the Revolutionary War the house was the heeadquarters of the Staten Island Committee of Safety, and a successful meeting place and shelter for Washington’s secret agents within enemy lines. This is likely the most historic house on Staten Island, if historic importance is the gauge. 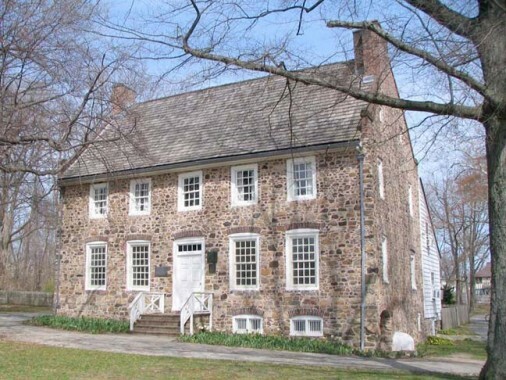 A brick mansion built by Christopher Billopp at about 1680 at the end of Hylan Boulevard was almost a century old on September 11, 1776 when Benjamin Franklin, John Adams, and Edward Rutledge met with Admiral Lord Howe in an attempt to stave off any future hostilities. Earlier that year, the patriots had been routed in the battle of Long Island by the admiral’s younger brother Gen. William Howe. The admiral was a friend of both Colonel Christopher Billopp, a descendant of the builder, and of Franklin. He came in with an offer from George III to forgo reprisals and grant the colonists more rights than other such in British colonies in other parts of the world had, if the colonies would renounce the fight for liberty. But Franklin and the others stood firm and insisted upon American independence. The conference was over in three hours, with Howe coming away believing it a disaster, and the patriots knowing that a tough fight lay ahead. What became known as the Conference House passed through many successive owners after the loyalist Billopps were forced to vacate after the revolution. It was even a factory making rat poison for a time, and like so many NYC historic buildings, it fell into abandonment and disrepair. In the 1920s, though, the Conference House Association was formed, and remaining features from the building’s past were restored to what they looked like when Howe met the patriots’ delegation. The Conference House welcomes visitors: call (718) 984-0415 or go to www.theconferencehouse.org. In front of the house, a vast lawn descends to the Arthur Kill, where you can walk the beach to Ward’s Point, a quiet, mostly deserted area beneath high bluffs. A look out across the water will reveal the Great Beds Lighthouse, built in 1878, about 3/4 miles out in Raritan Bay. Where Benj. Franklin, John Adams and and Ed. Rutledge met in parley with Lord Howe and Sir Henry Strachey, September 11, 1776. Above is a screen shot of Arthur Kill Road looking east at Getz Avenue at the Walgreens parking lot in Greenridge. The NYS historical sign marking the site of the old church built by Huguenots is no longer there, of course, but there is a photo of it at Secret Staten Island, where someone recalls seeing the weed-covered sign there in the 1940s. Thirty years later, the street grid came to Greenridge, followed by shopping malls containing huge parking lots, and all those frivolous memories about historic sites and long-gone churches were forever extirpated. 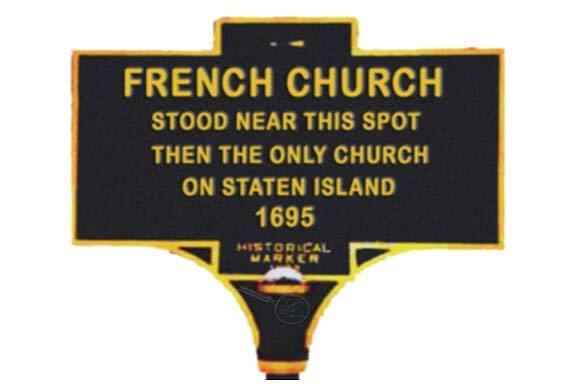 First permanent settlement made on Staten Island 1661 by Pierre Billiou & others with permission of the Dutch West India Company. Staten Island’s “old town” is marked only by Old Town Road today, named for the original 1660s Dutch “Oude Dorp” or Old Town, settlement. 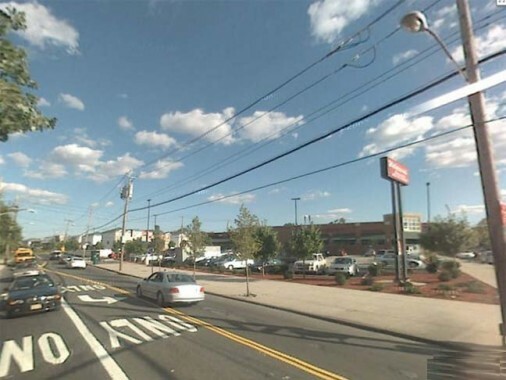 The larger “New Dorp” or Newtown, was founded a few miles south about ten years later. 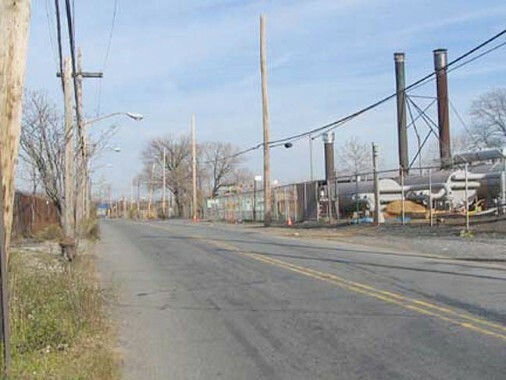 The sign was located near the intersection, seen here in a screenshot, by Old Town Road (foreground) and Richmond Road. Surprisingly enough I’ve been to some of the Staten Island NYS historic-markered sites. 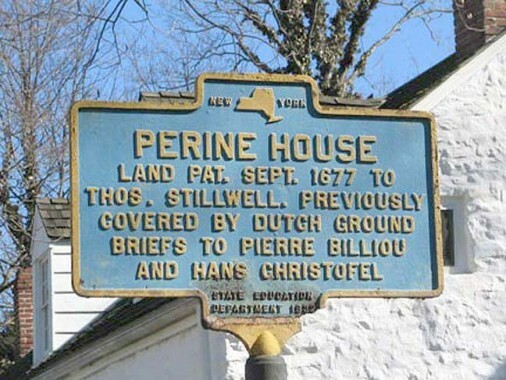 The Billiou-Stillwell-Perine House can be found at Richmond Road and Cromwell Avenue in Dongan Hills, and till recently, boasted an actual sign, though I heard it’s gone now. These photos are from my visit in the mid-2000s. This house on 1476 Richmond Road predates Thomas Dongan’s gubernatorial era. In a borough that preserves more 17th-Century dwellings than any other, this is its oldest: indeed it is the third oldest building in New York State. Like many colonial homes, it features a very small central section added to in subsequent years. 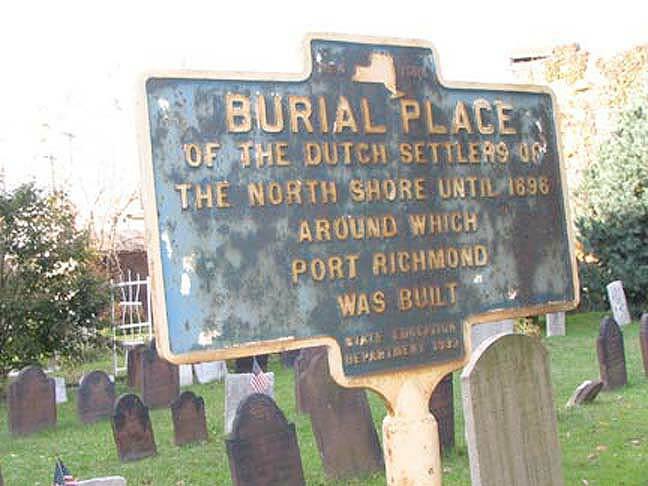 Pierre Billiou (1625-1708), a French Huguenot judicial officer and delegate to the New York general assembly, built a simple stone structure here in 1662 when the region was known as Oude Dorp (“Old Town”). Billiou’s daughter married a Thomas Stillwell, and the Stillwells occupied the dwelling till 1764, gradually adding to the structure; members of the Perine family then lived here until 1919. It’s currently maintained by the Staten Island Historical Society. The oldest section of the building, the center fieldstone part, may be seen by strolling around to the back. This still-extant HYC historical sign can be found in the churchyard of Staten Island Reformed Church at Port Richmond Avenue just off Richmond Terrace. It was constructed in 1844 and replaced three earlier churches on this site — the first one was chartered as early as 1696. According to historians, there was first a burial ground here, and later a church, with the graveyard first being used in the late 1600s and the first church constructed in 1715. In a borough filled with old, out of the way cemeteries, this is likely the oldest one that is still being used. I have highlighted Capt. 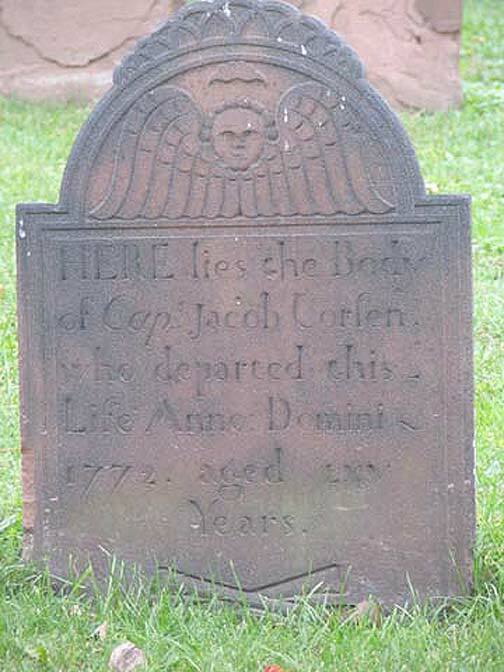 Jacob Corsen’s 1772 stone. It is thought the cemetery was, at first, a burial ground for the Corsen family (there is a Corson Avenue in New Brighton). 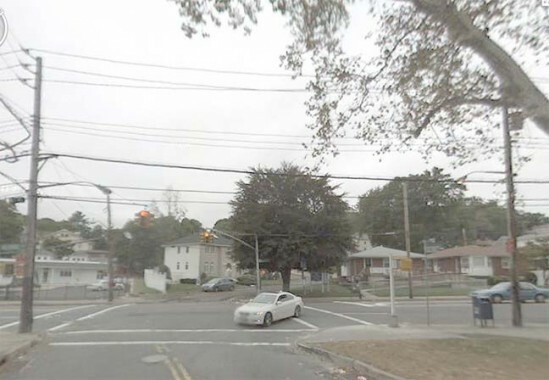 There are many families interred here whose names can be found on Staten Island street signs: Bodine, Haughwout, Latourette, Van Name, Van Pelt, Zeluff and many more. 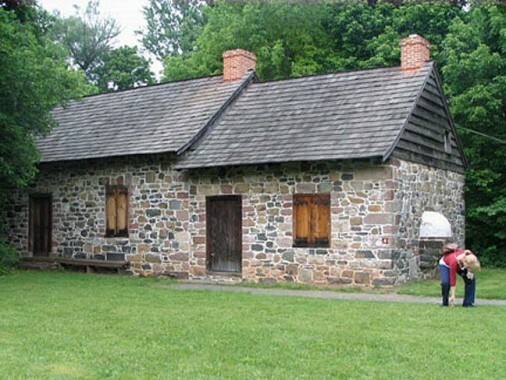 Used as a signal station in a military reservation near Bay St. Fortifications rebuilt 1812. I could be barking up the wrong tree here, since the sign was listed as being located “near Bay Street.” That narrows it down! And that’s where the NYS historical markers in NYC were. At least here, some of the signs have been kept unlike so many others that have long vanished throughout the city. 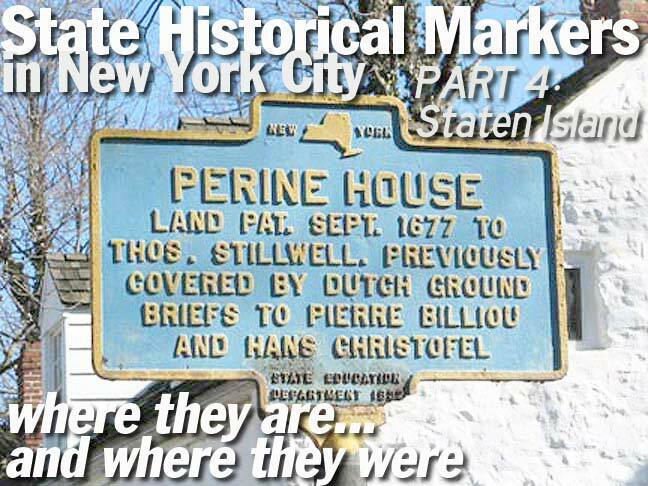 Kevin, thanks so much for your excellent piece on Staten Island’s historical markers. What great memories the photos brought back of visiting the Perine and Conference Houses as a kid and appreciating the history even then. I used to live in Old Town near the original 1740? schoolhouse on Hylan Blvd. What ever happened to that? Was it moved to Richmondtown? That Staten Island trailer park bears a striking resemblance to another one (Desert Palms?) in Apache Junction, AZ. It’s at the intersection of US 60 & Ironwood Drive. In Staten Island the towers of Manhattan dominate the horizon; in Apache Junction the same role is played by the Superstition Mountains. Try a Google Earth sometime.All you recovering New Yorkers in AZ know what I’m talking about.